It meets the A1(M) at junction 49. Perhaps, but I've got away with a similar claim in the past..
Just after you exit the main route of the A1(M) at junction 49, you come across what is called a "route confirmation" sign, that tells you the road number and distances to some of the places that can be reached along it. The signs the other way all say "A1(M)". Actually, both Simon Greenwood and Nick Gregg emailed in to the site to tell me all about it. I am sure I once saw "A168(M)" on a sign - though I can't recall where it was, it could well have been near Ripon. I have recently passed the A92(M) - the sign is clearly visible staying on the M90, so no wonder a green sign looked daft! Does the same apply to the A168(M)? Was there ever a green sign here? "The no hard shoulder sign as northbound traffic goes under the A1(M) was originally in metres. This was the first and only pure metric sign I have seen in this country. Now the sign looks badly repaired with an imperial measurement stuck over the metric. Your photo show the correction but not the value"
Another thing to add - The Marker Posts on the A1(M) Northbound Off slip at J49 (aka A168(M)) are numbered from 0/0A. So it cant be a slip road from the A1(M) because it would have continued the main numbers, 94/3J ... The marker posts coming Southbound towards J49 start at the first gantry (1 Mile). The "Dishforth Interchange" sign is left over from the original signing of the A168. It should have been removed when the D2D DBFO built the sign gantrys, but nobody got round to it. 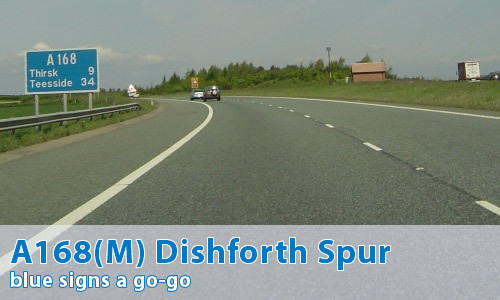 Did you notice the lack of signs on the gantry after the slip road to Dishforth village ?? - Hidden in plain sight! I live in Thirsk and use this road frequently. Travelling North off the A1(M), the actual "End of Motorway" sign does not appear until about 1 mile after the exit. There is also a hard shoulder until this sign. The end of the "Motorway" occurs just before the on-slip, presumably from the A1 coming South.